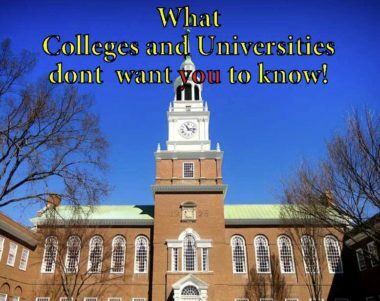 What Colleges and Universities don’t want you to know! Thousands of students graduate from high school every year in the US. Some students go straight to the work force, while others decide to pursue a degree at a college or university. For those heading to earn a college degree, financing it is a topic that must be thoroughly discussed multiple times prior to graduation. If future graduates don’t sit and discuss a financial plan, the college or university will create one for them. At first their plan may seem appealing, but in reality, it may not be as beneficial. First, the school gets paid on time. Once loans are approved, checks are sent to cover tuition, fees, and other school expenses. Second, colleges and universities encourage loans because students are more likely to finish faster. Rather than taking fewer classes and paying as they go, students with loans “can afford” to take as many classes as possible on a shorter period. A huge problem indeed. Third, it is also convenient for colleges and universities to graduate students at a rapid pace to maintain a fresh turnover of students. So, it appears as student loans may be favorable because it’s less hassle for both the student and the college and universities, but this is far from the case. These sort of thoughts are affecting young adults’ finances at a very early stage of their lives. Students are falling under pressure by society and are taken advantage of by colleges and universities. One of the problems is students are creating a habit of instant gratification. Young adults are not measuring the aftermath of student loans. The habit of instant gratification has deceived them from recognizing their financial limitations. Another problem to consider is the amount of debt. Students are graduating with a debt amount that is greater than what they would earn in their first year’s salary. Students should understand these loans take longer to pay off after graduation. A combination of interest rates and life implications may detour an effective financial strategy. First, search for grants and scholarship opportunities instead of loans. Consult your Financial Aid Advisor and Career Specialist for alternatives, and always get a second opinion! They are there to guide you and help you find the resources you need. You should also fill out the FAFSA application and attend Parent Academy workshops at your nearest public school. Second, don’t take student loans. It is not the only way to get through college. In fact, here at Saving For Hope, we had a post about paying for school. Instead, work hard and pay your classes with cash as you go. Who cares if it takes longer! It may take an additional two years, but at least you will be debt free. A friend shared a quote with me that I felt it resonates with this article, “Don’t give up what you want most for what you want now”. Enjoy! Santos A. O’Neill, a contributor to this blog, is a senior educator and post-graduate student that works with teens and young adults as they equip to go to college. He also works as a high school teacher and an athletic coach. ← The Joneses are living a lie! !